Preface In a way, this book is a successor of a former Dutch book called ‘Grondslagen van de Fruitteelt’ (‘Fundamentals of Fruit Production’), published in 1976. That handbook, edited by three Dutch researchers (J. Tromp, H. Jonkers, S. J. Wertheim), contained contributions of fruit researchers from the Netherlands, Belgium and South Africa. As the book was soon sold out, the editors were regularly approached for a renewed edition, but the time for such a task was always lacking. During the last two decades of the 20th century, the collaboration between fruit researchers within Europe greatly intensified, which led, among other things, to the foundation of Eufrin (European Fruit Research Institutes Network). In one of the annual Eufrin meetings, it was decided to try to publish a book comparable to the aforementioned Dutch textbook, but now written in the English language, with contributions from the various countries involved in the network at that time. The present book is a result of the efforts of ten authors, among them the three editors. 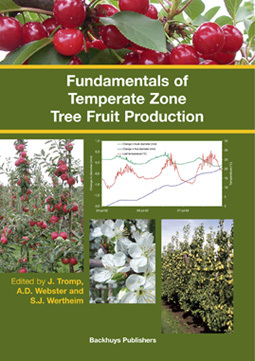 It covers a wide range of topics related to the various aspects of fruit growing and is meant for all people actively involved in temperate pome and stone fruit production, such as growers, nurserymen, advisors, post harvest specialists, as well as horticultural teachers and students. Therefore, highly specialized disciplines, such as modelling and biochemistry have been largely avoided. It should be made clear at the beginning that the book is not a manual with detailed recommendations for cultural practices, but rather tries to explain the underlying principles and mechanisms of the many phenomena practitioners regularly see or experience. Given the rapid developments in the various temperate fruit industries, a practically based manual would soon be out of date. Also, practices vary considerably between regions of fruit production, on account of differences in environmental factors and grower traditions. It is hoped that this book, which attempts to explain many of the principles underpinning these varied commercial practices, will be of more value in the longterm. In spite of the variations in style of writing between the 26 chapters, which invariably occurs when a range of individuals are involved in its production, we hope that the book will prove to be a valuable source of information for the many people involved in the various fruit industries. The Dutch editors gratefully acknowledge the collaboration Applied Plant Research, Fruit Research Unit, Randwijk, The Netherlands in putting their library and other facilities at their disposal. Also, the friendly collaboration with the publisher is gratefully acknowledged. The publisher, editors, authors or their (former) research institutes cannot accept any liability of loss, damage or injury resulting in the application of any concept, product or procedure in or derived from any part of this book.